If your leather shoes aren’t kept up, what's next? Your home, your car, YOUR LIFE? People might assume things about you (and it ain’t going to be pretty). So why sabotage your swag? 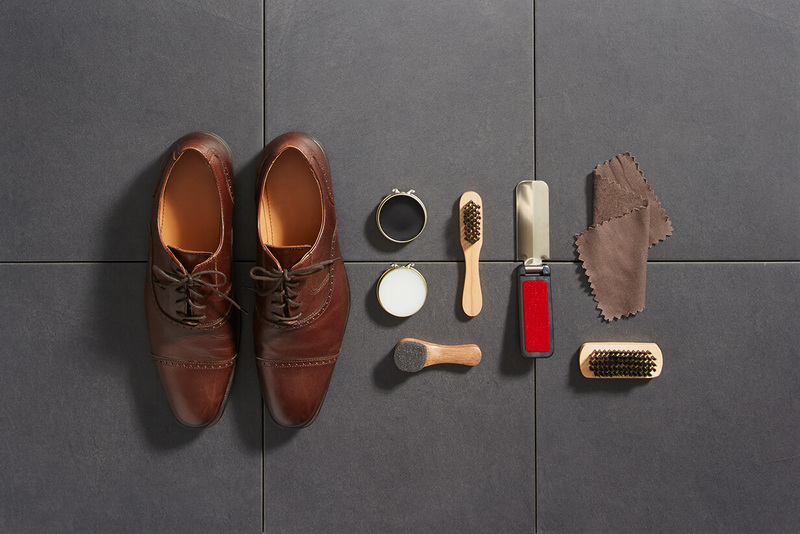 Shining your shoes doesn’t take long, and—let's be honest—it’s pretty cool to own a shine kit. Now, roll up your sleeves and remove your laces—it’s time to shine your shoes in five easy steps. Make sure you cover your work area with an old towel, and stuff your shoe with newspaper. Using warm water and diluted dish soap (or leather cleaner) on a cloth, gently wipe the exterior of your shoe. Buff with a clean horsehair brush to remove excess dirt. Using the foam sponge or round applicator brush, apply an even, thin layer of polish in a circular motion. Take care to get it into every crevice, including the area between the heel and shoe uppers. Allow 15 minutes for polish to dry. Next, use the horsehair brush to buff your shoes vigorously—in long strokes. The goal is to remove excess polish and give it a good shine. Pay more attention to the toe and heel until you’ve reached your desired shininess level. Repeat steps 3 & 4 as needed. Lastly, hold your shoe still and use your shine cloth to buff with a brisk side-to-side motion, removing any remaining polish. Your life, car and house may still be a disaster. But your shoes will be impeccable. And, hey, that’s what really counts.